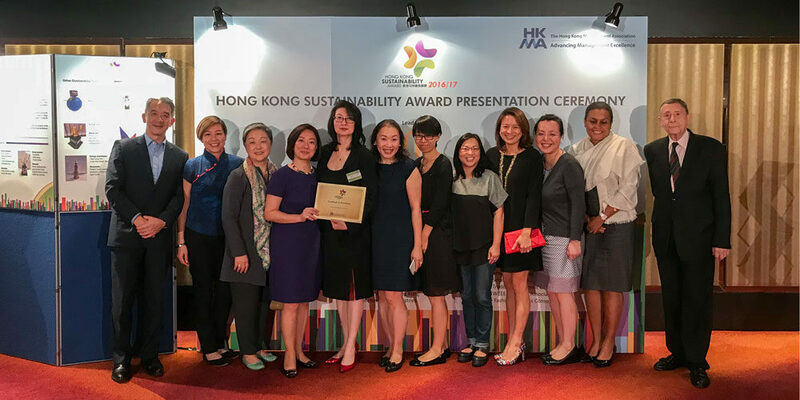 The Child Development Centre (CDC) was honoured to receive the Certificate of Excellence in the Hong Kong Sustainability Award 2016/2017. The award was introduced by the Hong Kong Management Association (HKMA) for the first time. This is a thrilling milestone for us, as recognition of our continuing effort and commitment in demonstrating sustainability in operations and governance. The CDC is dedicated to bringing positive social impact to society by providing tailored intervention services for children with additional needs and parenting support for their families. “We are committed to ensure the CDC works as a thriving, sustainable organisation. Thank you for the support and governance from our diversified committee board, which puts great effort in creating strategies, setting goals and monitoring progress across different aspects in accordance with our holistic view of sustainability.” emphasises Virginia (Chief Executive of the CDC). We are keen to diversify our income and revenue sources to guarantee that we can provide sustainable programmes and services. We believe collective efforts yield greater achievements. We proactively engage stakeholders through different channels to foster a community caring culture and promote partnerships with families and the local community. We were honoured to be invited to join the Award Presentation Ceremony on 16 November 2017 (Thursday) at the InterContinental Hotel. Our Chief Executive, Virginia Wilson represented the CDC to receive the Certificate of Excellence. Going forward, we hope to gain greater public support for our work in bringing life-long changes for children.